Does anyone remember these? 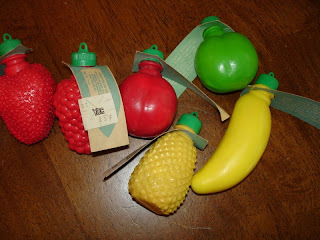 Little plastic fruit shaped containers filled with powdered sugar. I remember the strawberry one. 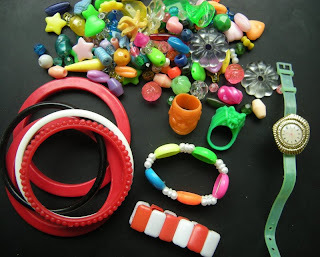 I had some of this "jewelry" when I was small. The red bumpy bracelet looks very familiar and I definitely had a stretch bracelet like the red and white one in front. I think mine was pink and white and I remember it broke when I was at my aunt's house. She said she would string it on elastic for me but she never did and years later when I was a teenager I remember her showing me the pieces she still had kept. The beads look familiar, too, especially the starfish shaped one. 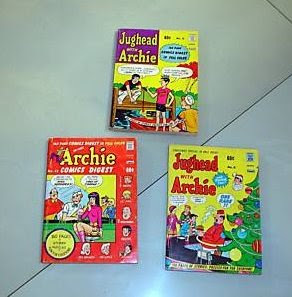 My younger sister, brother and I bought a lot of Archie comics, especially when we were on vacation. These are from the 70's and we probably read them.